Daylight Savings Time has come to an end and we’ve all turned back the clock. But early evening darkness doesn’t mean that you need to abandon your outdoor space throughout autumn, winter and early spring. With an attractive and economical deck lighting system, you can get the most out of your deck, even as the days grow shorter, increasing your deck’s usability and its safety. And there are an abundance of practical deck lighting options that offer plenty of style too! Deck post lights are installed on the railing posts of your deck and allow you to safely use your deck once the sun goes down. 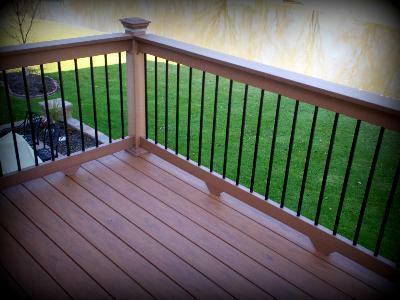 A variety of colors and finishes are available to either match or complement your deck and rails. Post lighting is often thought of as an ‘accent light’ that angles downward. Cap lighting is similar to post lighting because these lights are also located on the deck railing. More specifically however, they are located on the very top portion of the deck railing… on the ‘cap’. The two primary types of cap lighting are: subtle lighting which is incorporated into the cap or decorative, ‘lantern-style’ lighting that sits on top of the cap. Either style is effective for function and safety, so the choice is really a matter of personal preference. 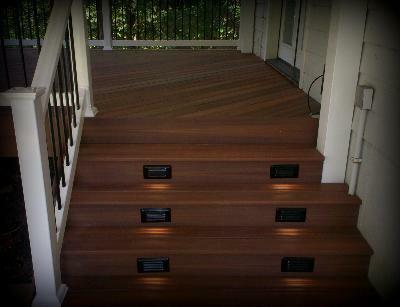 Lighting for deck steps is an important safety feature to avoid stumbles and falls. 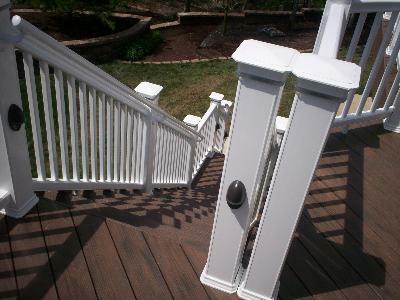 And for this reason, a deck contractor will usually recommend including step riser lights for every deck stairway since installation is simplest during initial construction. The lights are then installed directly into the step riser, illuminating the actual step. And like post and cap lighting, riser lights come in a variety of styles. For questions about adding lights for a custom deck design, or any other outdoor structure by Archadeck – please consider our company – Archadeck of West County and St. Charles County in St. Louis, Missouri. 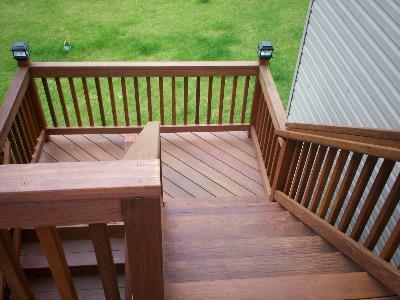 Be sure to browse our website, west-county.archadeck.com to see pictures of our completed projects for homeowners in and around St. Louis, Mo. Or better yet, give us a call – 636.227.0800. « How Long Should a Deck Last?